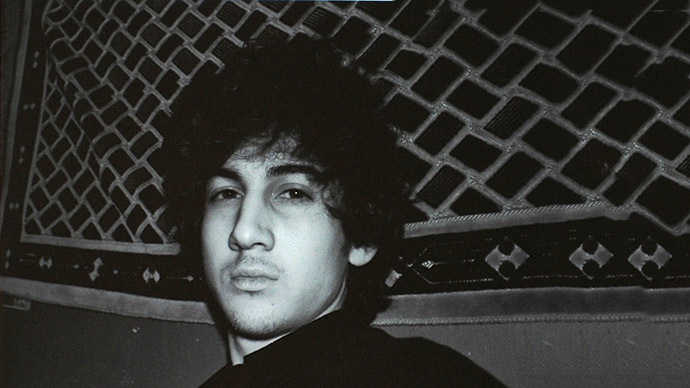 After Boston Magazine published previously unseen photographs of the night of suspected Boston Marathon bomber Dzhokar Tsarnaev’s capture, in response to a now controversial Rolling Stone cover, the man who released the pictures has had his badge revoked. The new images, which were provided by Sgt. 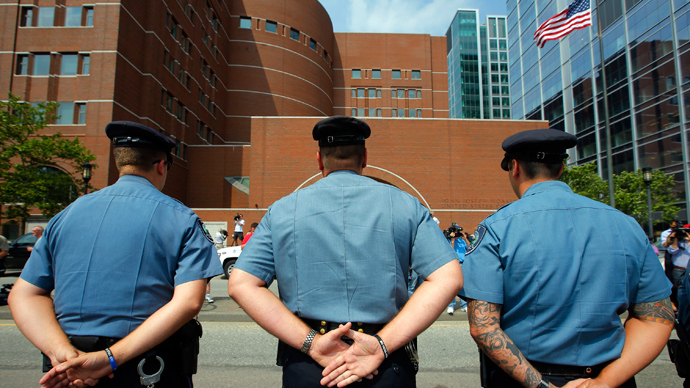 Sean Murphy, a tactical photographer with the Massachusetts State Police, were accompanied by a statement written by Murphy, who was angered by the magazine cover of Tsarnaev, arguing that it promoted an unfair image of the suspected terrorist. “The truth is that glamorizing the face of terror is not just insulting to the family members of those killed in the line of duty, it also could be an incentive to those who may be unstable to do something to get their face on the cover of Rolling Stone magazine,” wrote Murphy. Sgt. Sean Murphy has been relieved of duty. Post coming shortly. On Thursday evening Murphy told CNN that he had been placed on leave from his job pending a review next week. Earlier in the day, a police spokesman had told reports that the agency had not authorized publication of the photos Murphy had taken. 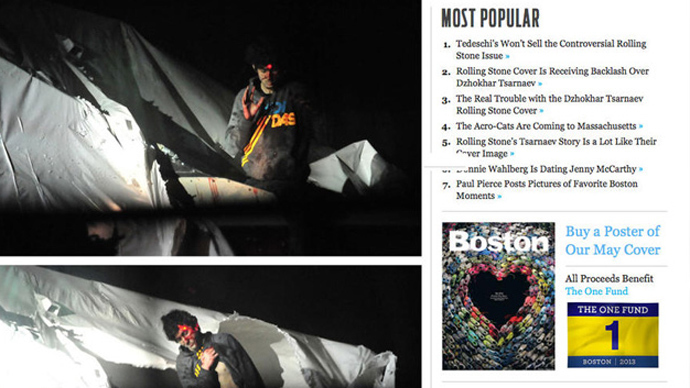 Unlike the Rolling Stone cover, which takes what critics describe as a glamorous, stylized portrait of the youngest Tsarnaev brother - the eldest having been killed during a confrontation with police - Murphy’s photographs depict Tsarnaev at the moment of his capture, bloodied and emerging from a boat in the residential backyard where police converged on him in Watertown, Massachusetts just prior to his surrender. Most striking to what has become that key image is a sniper’s clearly visible red laser target on Tsarnaev’s forehead as he surrenders to authorities. Additional images taken on April 19 show Tsarnaev lying on the ground and receiving emergency medical care, as well as photos of police and emergency response workers during the manhunt through the Boston suburbs. "This guy is evil," Murphy tells Boston magazine. "This is the real Boston bomber. Not someone fluffed and buffed for the cover of Rolling Stone magazine." Though Rolling Stone is known for producing controversial images, these are generally of individuals remarkable for their musical or cultural impact. 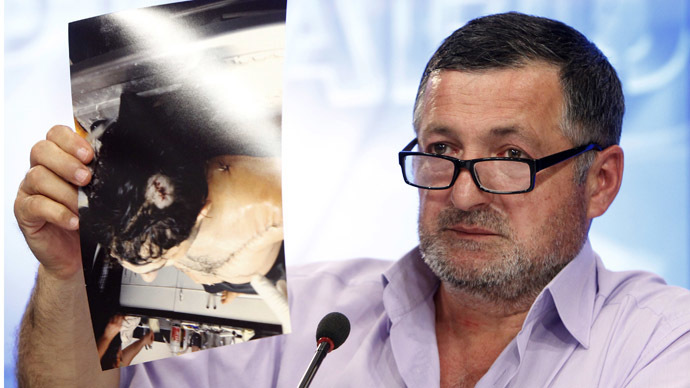 The choice to depict the bombing accomplice on its cover has been interpreted by many as offensive to his victims. According to Murphy, who is also responsible for photographing the funeral ceremonies of police officers, the August magazine cover is a sad reminder for victims of the bombings. A number of Boston-area and US retail chains said on Wednesday that they would not stock the Rolling Stone edition out of concern from the developing controversy.